Looking after oil on your farm or at your horticultural business is more than meeting the requirements of the regulations on storing oil. To reduce the risk of losing your oil, causing pollution and having to pay for a clean-up you need to take care of every aspect of your oil delivery, storage, use and disposal. What is fuel oil storage? A fuel oil store can be a single tank, multiple tanks, intermediate bulk containers (IBCs), drums or mobile bowsers; or a combination of these. They can be in one area or spread across your site. Which regulations apply depends on the type of oil you store, what you will be using the oil for and how much you store. 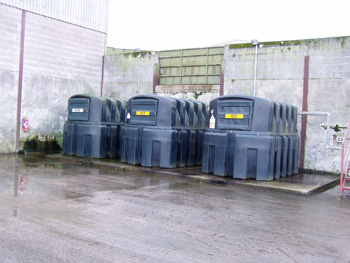 Our information on legal requirements for oil storage will help you find the regulations that apply to your oil stores; on a farm you may need to meet up to three sets of regulations with different requirements. Before a delivery, check you have capacity for the quantity of oil you’re ordering. Make sure tanks are clearly labelled with the fuel capacity and fuel type. You should aim to supervise every oil delivery. You can make sure the oil is put where you need it and that pets or other animals are secured. Keep the access route to the oil store clear of vehicles, bins, tools and equipment, or waste materials. And, if there’s a problem with your oil store or a spill happens during the delivery you’ll be on hand to help and discuss your options. After the delivery, check that the contents gauge registers the new quantity of oil. This is especially important if you weren’t able to supervise the delivery as your fuel may have been delivered elsewhere, you may have received a different quantity or the oil may have leaked away. If you have an external sight gauge, make sure it hasn’t been dislodged and its valve is in the closed position. Check for any changes in appearance of the oil store and its supporting structure. Check for any fresh oil spills or leaks and report a suspected delivery spill to the fuel supplier as soon as possible. If you find a spill and aren’t sure how to deal with it call the national incident/pollution hotline on 0800 80 70 60 to report the incident and ask for advice, the line is open 24 hours, calls are free from land lines but there may be a charge if you’re using a mobile. More ideas are available in our information on theft prevention. Would you and your staff know what to do if there’s an oil spill? Be prepared! Good planning and preparation reduces the risk of a spill becoming a pollution incident. Find how to prepare for a spill with our spill training information. Produce a pollution incident response plan so that you, your employees and others who visit your site regularly know what to do if an incident occurs. All oil storage should be regularly checked to ensure that it’s in good condition. Where refuelling tanks are used they should be maintained in line with manufacturer’s instructions to ensure that filters, shut-off valves, flexible hoses, and other equipment are in good order and operate correctly. If you have any doubt about the integrity of an oil storage installation, we recommended you take advice from a qualified oil professional. Make sure maintenance or repairs are carried out promptly by a competent person. For general advice on the installation of fuel oil storage tanks and oil tank maintenance, contact a competent person. Competent Person Scheme (CPS) operators typically offer a local technician search facility online or by phone. CPS operators can be found online at the Competent Persons Register.